The New Testament apocrypha are a number of writings by early Christians that give accounts of Jesus and his teachings, the nature of God, or the teachings of his apostles and of their lives. Some of these writings have been cited as scripture by early Christians, but since the fifth century a widespread consensus has emerged limiting the New Testament to the 27 books of the modern canon. Thus Roman Catholic, Eastern Orthodox and Protestant churches generally do not view these New Testament apocrypha as part of the Bible. The word "apocrypha" means "things put away" or "things hidden," originating from the Medieval Latin adjective apocryphus, "secret" or "non-canonical," which in turn originated from the Greek adjective ἀπόκρυφος (apokryphos), "obscure," from the verb ἀποκρύπτειν (apokryptein), "to hide away." From the Greek prefix "apo" which means "away" and the Greek verb "kryptein" which means "to hide". The general term is usually applied to the books that were considered by the church as useful, but not divinely inspired. As such, to refer to Gnostic writings as "apocryphal" is misleading since they would not be classified in the same category by orthodox believers. Often used by the Greek Fathers was the term antilegomena, or "spoken against", although some canonical books were also spoken against, such as the Apocalypse of John in the East. 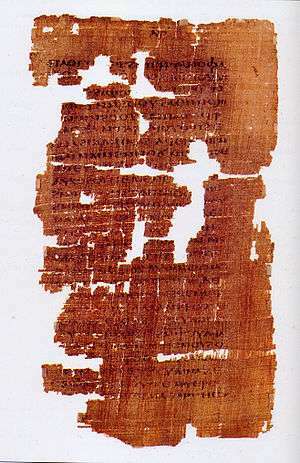 Often used by scholars is the term pseudepigrapha, or "falsely inscribed" or "falsely attributed", in the sense that the writings were written by an anonymous author who appended the name of an apostle to his work, such as in the Gospel of Peter or The Æthiopic Apocalypse of Enoch: almost all books, in both Old and New Testaments, called "apocrypha" in the Protestant tradition are pseudepigrapha. In the Catholic and Orthodox traditions, what are called the apocrypha by Protestants include the deuterocanonical books: in the Catholic tradition, the term "apocrypha" is synonymous with what Protestants would call the pseudepigrapha, the latter term of which is almost exclusively used by scholars. That some works are categorized as New Testament Apocrypha is indicative of the wide range of responses that were engendered in the interpretation of the message of Jesus of Nazareth. During the first several centuries of the transmission of that message, considerable debate turned on safeguarding its authenticity. Three key methods of addressing this survive to the present day: ordination, where groups authorize individuals as reliable teachers of the message; creeds, where groups define the boundaries of interpretation of the message; and canons, which list the primary documents certain groups believe contain the message originally taught by Jesus. There was substantial debate about which books should be included in the canons. In general, those books that the majority regarded as the earliest books about Jesus were the ones included. Books that were not accepted into the canons are now termed apocryphal. Some of them were vigorously suppressed and survive only as fragments. The earliest lists of canonical works of the New Testament were not quite the same as modern lists; for example, the Book of Revelation was regarded as disputed by some Christians (see Antilegomena), while Shepherd of Hermas was considered genuine by others, and appears (after the Book of Revelation) in the Codex Sinaiticus. The Syriac Peshitta, used by all the various Syrian Churches, originally did not include 2 Peter, 2 John, 3 John, Jude and Revelation (and this canon of 22 books is the one cited by John Chrysostom (~347-407) and Theodoret (393-466) from the School of Antioch). Western Syrians have added the remaining five books to their New Testament canons in modern times (such as the Lee Peshitta of 1823). Today, the official lectionaries followed by the Malankara Syrian Orthodox Church and the East Syriac Chaldean Catholic Church, which is in communion with the Bishop of Rome, still only present lessons from the 22 books of the original Peshitta. The Armenian Apostolic church at times has included the Third Epistle to the Corinthians, but does not always list it with the other 27 canonical New Testament books. This Church did not accept Revelation into its Bible until 1200 CE. The New Testament of the Coptic Bible, adopted by the Egyptian Church, includes the two Epistles of Clement. English translations were made in the early 18th century by William Wake and by Jeremiah Jones, and collected in 1820 by William Hone's Apocryphal New Testament. The series Ante-Nicene Fathers, vol. 8, contains translations by Alexander Walker. New translations by M. R. James appeared in 1924, and were revised by J.K. Eliott in 1991, The Apocryphal New Testament. The "standard" scholarly edition of the New Testament Apocrypha in German is that of Schneemelcher, and in English its translation by Wilson (1991). Tischendorf and other scholars began to study New Testament apocrypha seriously in the 19th century and produce new translations. The texts of the Nag Hammadi library are often considered separately but the current edition of Schneemelcher also contains eleven Nag Hammadi texts. Books that are known objectively not to have existed in antiquity are usually not considered part of the New Testament Apocrypha. Among these are the Libellus de Nativitate Sanctae Mariae (also called the "Nativity of Mary") and the Latin Infancy gospel. The latter two did not exist in antiquity, and they seem to be based on the earlier Infancy gospels. Four gospels came to be accepted as part of the New Testament canon. The rarity of information about the childhood of Jesus in the canonical gospels led to a hunger of early Christians for more detail about the early life of Jesus. This was supplied by a number of 2nd century and later texts, known as infancy gospels, none of which were accepted into the biblical canon, but the very number of their surviving manuscripts attests to their continued popularity. Most of these were based on the earliest infancy gospels, namely the Infancy Gospel of James (also called the "Protoevangelium of James") and Infancy Gospel of Thomas, and on their later combination into the Gospel of Pseudo-Matthew (also called the "Infancy Gospel of Matthew" or "Birth of Mary and Infancy of the Saviour"). The other significant early infancy gospels are the Syriac Infancy Gospel, the History of Joseph the Carpenter and the Life of John the Baptist. The Jewish–Christian Gospels were gospels of a Jewish Christian character quoted by Clement of Alexandria, Origen, Eusebius, Epiphanius, Jerome and probably Didymus the Blind. Most modern scholars have concluded that there was one gospel in Aramaic/Hebrew and at least two in Greek, although a minority argue that there were only two, Aramaic/Hebrew and Greek. 1) The Gospel of the Ebionites ("GE") – 7 quotations by Epiphanius. 2) The Gospel of the Hebrews ("GH") – 1 quotation ascribed to Cyril of Jerusalem, plus GH 2–7 quotations by Clement, Origen, and Jerome. 3) The Gospel of the Nazarenes ("GN") – GN 1 to GN 23 are mainly from Jerome; GN 24 to GN 36 are from medieval sources. Some scholars consider that the 2 last named are in fact the same source. Some scholars regard the Gospel of Thomas as part of the tradition from which the canonical gospels eventually emerged; in any case both of these documents are important as showing us what the theoretical Q document might have looked like. Although three texts take Bartholomew's name, it may be that one of the Questions of Bartholomew or the Resurrection of Jesus Christ is in fact the unknown Gospel of Bartholomew. A number of texts aim to provide a single harmonization of the canonical gospels, that eliminates discordances among them by presenting a unified text derived from them to some degree. The most widely read of these was the Diatessaron. In the modern era, many Gnostic texts have been uncovered, especially from the Nag Hammadi library. Some texts take the form of an expounding of the esoteric cosmology and ethics held by the Gnostics. Often this was in the form of dialogue in which Jesus expounds esoteric knowledge while his disciples raise questions concerning it. There is also a text, known as the Epistula Apostolorum, which is a polemic against Gnostic esoterica, but written in a similar style as the Gnostic texts. Several texts concern themselves with the subsequent lives of the apostles, usually with highly supernatural events. Almost half of these are said to have been written by Leucius Charinus (known as the Leucian Acts), a companion of John the apostle. The Acts of Thomas and the Acts of Peter and the Twelve are often considered Gnostic texts. While most of the texts are believed to have been written in the 2nd century, at least two, the Acts of Barnabas and the Acts of Peter and Paul are believed to have been written as late as the 5th century. Third Epistle to the Corinthians - accepted in the past by some in the Armenian Orthodox church. While many of the books listed here were considered heretical (especially those belonging to the gnostic tradition—as this sect was considered heretical by Proto-orthodox Christianity of the early centuries), others were not considered particularly heretical in content, but in fact were well accepted as significant spiritual works. While some of the following works appear in complete Bibles from the fourth century, such as 1 Clement and The Shepherd of Hermas, showing their general popularity, they were not included when the canon was formally decided at the end of that century. The victors in the struggles to establish Christian Orthodoxy not only won their theological battles, they also rewrote the history of the conflict; later readers then naturally assumed that the victorious views had been embraced by the vast majority of Christians from the very beginning ... The practice of Christian forgery has a long and distinguished history ... the debate lasted three hundred years ... even within "orthodox" circles there was considerable debate concerning which books to include. ...But Hermas wrote The Shepherd very recently, in our times, in the city of Rome, while bishop Pius, his brother, was occupying the chair of the church of the city of Rome. And therefore it ought indeed to be read; but it cannot be read publicly to the people in church either among the Prophets, whose number is complete, or among the Apostles, for it is after their time. ↑ Van Liere, Frans (2014). An Introduction to the Medieval Bible. Cambridge University Press. pp. 68–69. 1 2 Ehrman, Bart D. (2003). Lost Christianities: Battles for Scripture and the Faiths We Never Knew. Oxford University Press. pp. 230–231. ↑ Charlesworth, James H (1985). Old Testament Pseudepigrapha. Peabody, MA: Hendrickson. p. 2257. ISBN 978-1-59856-489-1. ↑ Reliability Archived October 8, 2007, at the Wayback Machine. ↑ The apocryphal New Testament, being all the gospels, epistles, and other pieces now extant. London, W. Hone. 1820. ↑ ANF08...Apocrypha of the New Testament. ↑ The fifth Gospel: the Gospel of Thomas comes of age - 1998 p105 Stephen J. Patterson, James McConkey Robinson, Hans-Gebhard Bethge -"The current edition of Wilhelm Schneemelcher's standard New Testament Apocrypha contains eleven Nag Hammadi tractates,"
↑ Elliott 2005, p. 3. ↑ Ehrman & Pleše 2011, p. 199. ↑ Vielhauer & Strecker 1991, pp. 134–78. New Testament Apocrypha - Tabulation includes Gnostic Gospels (23) and Gnostic Acts (29), linked to English translations.